That’s my life at the moment and somehow doubt if it will ever change, the other side of that is , do I want it to change ? Somedays I get very tired and long for some time to do nothing with .How long before I felt lost without my busy life I wonder. I have since my last post covered a couple of very nice events, Kyle my second grandson turned 13 so we took him for an overnight trip to Cardiff, stayed at our favorite hotel The Marriott and our usual suite which he loved and the hotel really made it special for him with a banner and balloons in the room. He is a lovely young man and is into trendy clothes and trainers, so he loved shopping, he loved eating at good restaurants and loved the executive lounge in the hotel, we enjoyed sharing this with him. 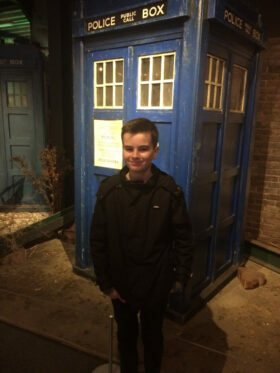 Next morning it was a trip to the Dr Who experience which we all loved and then just a little more shopping, more food and then home, it was a great time. I also booked myself a weeks leave, first time I have been able to that since Kadey started working with us, normally I would take leave which meant leaving Joanne on her own to cope, which is so hard .Paige is full time care so leaving Jo alone with one autistic son and two little ones, plus animals and a teenager getting ready for university is not right. Poor Joanne also came down with a chest infection at the same time so thank god we had Kadey on board, she is great, yes she needed Jo’s guidance this type of nursing does not come overnight it takes years of hard work but she is very instinctive which I believe a lot of care work is about, follow that gut instinct it is right nine times out of ten. I got to spend a day of sheer bliss with a great friend of mine Tracy, we are so in tune with each other we can talk or stay quiet ,we can laugh together or cry together is was a great feeling spending that time with her and we spent that day at Aqua Sana longleat Center Parcs total relaxation worth every penny, cannot wait to do it again. My week was very nice I did not quite get the time I needed as I kept popping in to see Paige and then she would not let me leave , it was nice to be there just as Granny for a change. I did get to make a quick lunch one day for Jo and I here at home and it was so nice this is something we don’t often get to do.